Evolution on islands differs in a number of important ways from evolution on mainland areas. Over millions of years of isolation, exceptional and sometimes bizarre mammals evolved on islands, such as pig-sized elephants and hippos, giant rats and gorilla-sized lemurs that would have been formidable to their mainland ancestors. 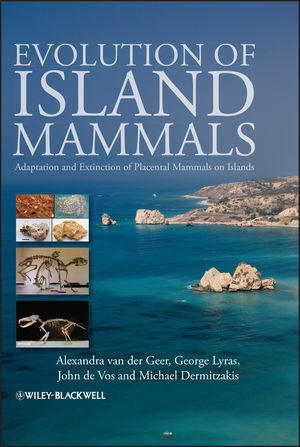 This timely and innovative book is the first to offer a much-needed synthesis of recent advances in the exciting field of the evolution and extinction of fossil insular placental mammals. It provides a comprehensive overview of current knowledge on fossil island mammals worldwide, ranging from the Oligocene to the onset of the Holocene. The book addresses evolutionary processes and key aspects of insular mammal biology, exemplified by a variety of fossil species. The authors discuss the human factor in past extinction events and loss of insular biodiversity. This accessible and richly illustrated textbook is written for graduate level students and professional researchers in evolutionary biology, palaeontology, biogeography, zoology, and ecology. Alexandra van der Geer is an independent researcher, presently guest researcher at Naturalis, the National Museum of Natural History of the Netherlands and at the Department of Geology and Geoenvironment at the University of Athens, Greece. She publishes on various subjects, including insularity, primatology and the relation between humans and animals. Among her previous books are Animals in Stone and Hoe dieren op eilanden evolueren. George Lyras is curator of the Museum of Geology and Palaeontology of the University of Athens, Greece. His research focuses primarily on the evolution of carnivores and of insular mammals. He currently specialises in evolutionary processes of the mammalian skull under strong selective forces. John de Vos is curator of the Dubois Collection and the Collection of Pleistocene mammal fossils from the Netherlands and the North Sea at Naturalis, the National Museum of Natural History of the Netherlands. His expertise and field of research include the taxonomic, systematic, geographic and stratigraphic research of the Pleistocene mammals of Southeast Asia in relation to fossil humans and fossil island faunas. Michael Dermitzakis is emeritus professor in the Department of Geology and Geoenvironment at the University of Athens, Greece, and former vice-rector of the same university. He is a recognized expert in the field of island biogeography of the Aegean Archipelago and the advocate of international research on the palaeo-ecology of Greek islands. Part I Beyond the Mainland. 2 History of Island Studies. 3 Factors that Influence Island Faunas. Part II The Islands and Their Faunas. 17 The Southern and Central Ryukyu Islands. 18 The Californian Channel Islands. Part III Species and Processes. 20 Elephants, Mammoths, Stegodons and Mastodons. 21 Rabbits, Hares and Pikas. 22 Rats, Dormice, Hamsters, Caviomorphs and other Rodents. Shorter Limbs and Stiff Joints. 28 Evolutionary Processes in Island Environments. Types of Speciation on Islands. 29 Extinction of Insular Endemics.